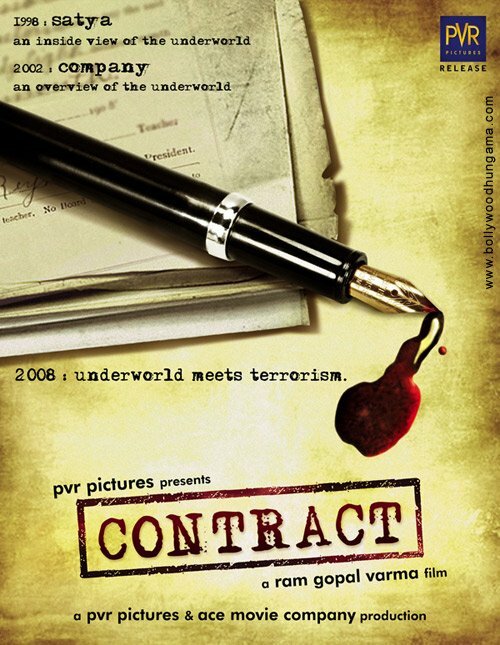 Deal Book. 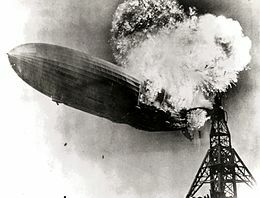 With regrets, we must once again check our defences – our “air defences” – as Mr. William (Bill) Ackman of the hedge fund, Pershing Square Capital Management LP, has taken a commanding position in Air Products & Chemicals Incorporated, which is currently in the Perpetual Bond™, as is its competitor in the same business, Airgas Incorporated. Please see Exhibit 1 and 2 below. Are you sure that you want it now? These large “activist investments” are illiquid, and the net result of positive gains in some (such as the Canadian Pacific Railway) and large losses on others such as J.C. Penney ($700 million) and possibly, Herbalife, in which he stills holds a large short position of about $1 billion that is now ($300 million) in the red – going to crimson if it is called in at any time by its owners who might want to take profits before anything bad happens to the stock price – have handed his investors less than +3% gains this year, on paper, but not yet in their pockets (Reuters, August 18, 2013, How Ackman’s Herbalife bet inflamed Wall Street passions) because redemptions tend to be on a contract basis rather than a demand basis, and investors who need or want their money now might only be able to sell their interest to the fund itself. Having “bombed” at retail (Reuters, August 21, 2013, Ackman acknowledges retail blunders, digs in on Herbalife) and “fortified” the interests of several other large hedge fund investors against him (ibid, Reuters, August 18), the “Hindenburg Omen” is also afoot, again (Breakout, August 21, 2013, Hindenburg Omen: Very Ominous, Highly Technical Warning Sign Returns) and that does not bode well for inflatable combustible stocks for which investors do not know the price of risk or what to do about it. Please see Exhibit 1 and 2 below and almost any of the previous (B)(N)-Company posts for more information on what that means. 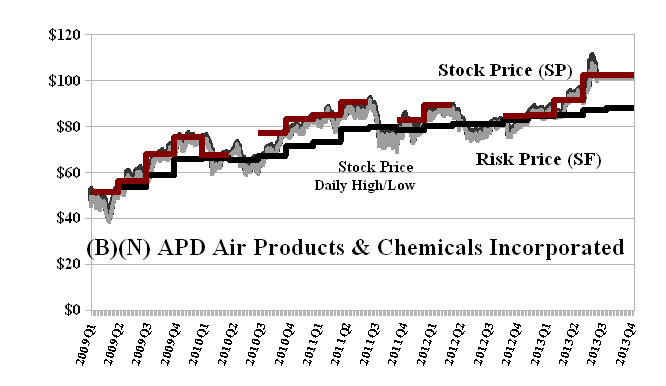 Although Air Products has welcomed Pershing Square Capital as a new investor (PRNewswire, July 31, 2013, Air Products Issues Statement Regarding Pershing Square Investment), the company has also adopted a “shareholder rights plan” that could deflate the stock by more than 100% in the event of an unsolicited hostile bid for the company (PRNewswire, July 25, 2013, Air Products Adopts Stockholder Rights Plan). We, too, are just plain old investors, and take comfort in the fact that all we want is that our investment is safe – 100% capital safety – and that we have a hopeful but not necessarily guaranteed return above the rate of inflation. But, for more on that, please see our recent Post, The S&P TSX “Hangdog” Market. Air Products is a $21 billion company that will pay its shareholders a dividend of $600 million this year for a current yield of 2.8%. It’s trading at $100 and well above the current Risk Price (SF) of $85 and rising, and our estimate of the downside due to ambient volatility is minus ($12) per share reflecting recent activity. From the Company: Air Products and Chemicals Incorporated provides atmospheric gases, process and specialty gases, performance materials, equipment, and services worldwide. The companys Merchant Gases segment sells atmospheric gases, such as oxygen, nitrogen, and argon; process gases, including hydrogen and helium; and medical and specialty gases for the metal, glass, chemical processing, food processing, healthcare, steel, general manufacturing, and petroleum and natural gas industries. Its Tonnage Gases segment provides hydrogen, carbon monoxide, nitrogen, oxygen, and synthesis to the energy production and refining, chemical, and metallurgical industries; and produces Polyurethane Intermediates. The companys Electronics and Performance Materials segment offers nitrogen trifluoride, silane, arsine, phosphine, white ammonia, silicon tetrafluoride, carbon tetrafluoride, hexafluoromethane, critical etch gases, and tungsten hexafluoride; and tonnage gases, specialty chemicals, and services and equipment for the manufacture of silicon and compound semiconductors, thin film transistor liquid crystal displays, and photovoltaic devices. This segment also provides performance materials for a range of products, including coatings, inks, adhesives, civil engineering, personal care, institutional and industrial cleaning, mining, oil refining, and polyurethanes. Its Equipment and Energy segment designs and manufactures cryogenic equipment for air separation, hydrocarbon recovery and purification, natural gas liquefaction, and helium distribution; and offers plant design, engineering, procurement, and construction management services for the chemical and petrochemical manufacturing, oil and gas recovery and processing, and steel and primary metals processing industries. The company was founded in 1940, has 21,000 employees, and is headquartered in Allentown, Pennsylvania. 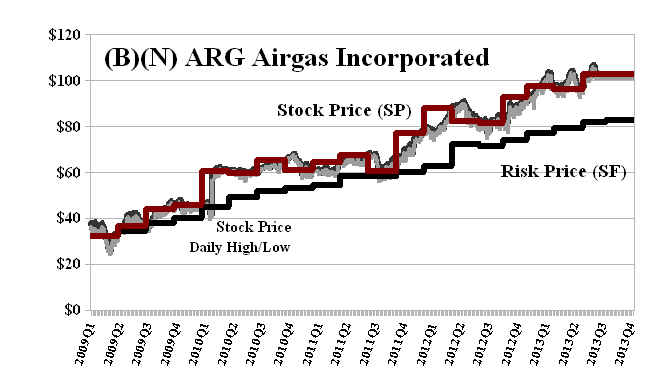 Airgas Incorporated is a $7.5 billion company that will pay its shareholders an expected dividend of $140 million this year for a current yield of 1.9%. It is also trading at $100 and well above its current Risk Price (SF) of $80 and rising. Our estimate of the downside due to ambient volatility is minus ($8) per share. From the Company: Airgas Incorporated through its subsidiaries, engages in the distribution of industrial, medical, and specialty gases in the United States. It offers nitrogen, oxygen, argon, helium, hydrogen, welding, and fuel gases, such as acetylene, propylene and propane, carbon dioxide, nitrous oxide, ultra high purity grades, special application blends, and process chemicals. The company is also involved in the rental of gas cylinders, cryogenic liquid containers, bulk storage tanks, tube trailers, and welding and welding related equipment; and distribution of hardgoods consisting of welding consumables and equipment, safety products, and construction supplies, as well as maintenance, repair, and operating supplies. In addition, it offers liquid carbon dioxide, dry ice, ammonia, and refrigerants, as well as atmospheric merchant gases. The company serves repair and maintenance, industrial manufacturing, energy and infrastructure construction, medical, petrochemical, food and beverage, retail and wholesale, analytical, utilities, transportation, and other industries. Airgas, Inc. markets its products through various sales channels, which include branch-based sales representatives, retail stores, strategic customer account programs, telesales, catalogs, e-business, and independent distributors. The company was founded in 1982, has 15,000 employees, and is based in Radnor, Pennsylvania.